The Disappearance of Eleanor Rigby: Them, reviewed. Why did Harvey Weinstein have a director transform two reportedly fascinating romantic dramas into one bland one? 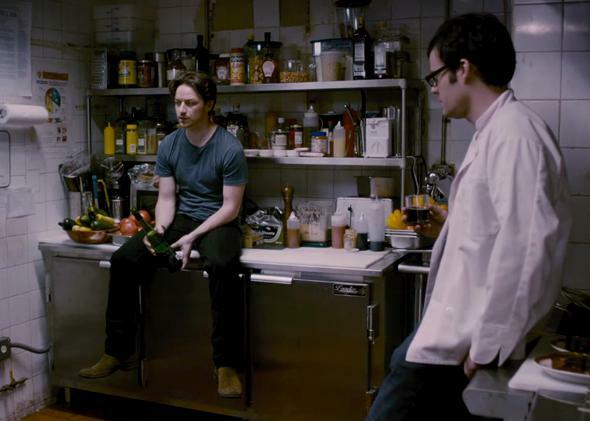 James McAvoy and Bill Hader in The Disappearance of Eleanor Rigby: Them. I’m not entirely sure why Ned Benson’s The Disappearance of Eleanor Rigby: Them even exists. The Weinstein Company, in Harvey’s infinite wisdom, had Benson piece together this two-hour film out of scenes from two separate features, The Disappearance of Eleanor Rigby: Him and Her, which both premiered to raves at last year’s Toronto Film Festival. Now Them is getting a wide release only a few weeks before Him and Her open in limited markets. This is a very strange choice on the part of the Weinstein Company. And one that, in my view—having been able to see only the Frankenstein version as of this writing—bespeaks a dispiriting lack of respect for their viewers’ intelligence. As I understand it, the entire point of Benson’s original project was to tell the same love story twice, once from the point of view of each lover—a high-concept approach, sure, but hardly one beyond the ken of your average art-house viewer. If you have to make Them, why not release all three simultaneously, or show Him and Her on demand, where the company’s already made so much money this year on Snowpiercer? Why take the risk that bad word-of-mouth from the Frankenstein-version release will drive potential viewers away from the apparently more interesting ones? In short, why do festivalgoers get to start with caviar while the rest of us have to wait through a first course of canned tuna? Perhaps it’s too harsh to compare Them, an elegantly restrained romantic drama with two stellar lead performances from Jessica Chastain and James McAvoy, to a can of Chicken of the Sea. It boasts (nearly) all the elements of a perfectly fine, even very good, movie, without ever quite becoming a movie at all. Scene after scene is lushly lit and shot (by cinematographer Christopher Blauvelt), powerfully acted, and beautifully (if sometimes a little over-) written. But what the whole thing lacks, paradoxically enough, is exactly what each of the two movies it’s made up of were created to demonstrate: a point of view. As we alternate between the daily realities of Eleanor (Chastain) and Conor (McAvoy)—a young married couple now living separately in the wake of a recent traumatic event whose dimensions are only very gradually disclosed—it’s often a struggle (or worse, a slog) to sort out just whose story is being told, by whom and for what reason. The movie opens on an achingly romantic but also ominous flashback to Eleanor and Conor as brand-new lovers, running out on the check at a fancy bistro before making out among fireflies in the park. The lingering question left behind by this dine-and-dash scene will hover over the rest of the movie: Are these unlucky lovers rebellious free spirits or irresponsible, selfish jerks? One imagines they would each answer that question differently at different points in their relationship, an approach that may be implemented in the coming chapters. But in this cut at least, Benson splits the difference, withholds all judgment, and makes his characters and his movie less interesting for it. Some of the dialogue in these Eleanor scenes has a writerliness that can feel suffocating. For a family supposedly numbed by trauma, the Rigbys do a lot of poetic musing and elaborate comparisons of things to other things. (To be fair, they are the kind of cultured post-hippie couple who named their first child Eleanor Rigby, in honor of their meeting at a false-alarm Beatles reunion.) Eleanor’s father, a tweedy psychology professor, is especially given to sententious bromides and lengthy, insufficiently obscure parables, and while Hurt delivers the lines with a lovely gravity and his signature offbeat pacing, I wished there weren’t quite so many of them to deliver. When you cast actors of this caliber opposite each other, there’s no need to equip each one with a thesis sentence about his or her motivations. Sometimes an exchanged glance or a pregnant pause is thesis enough. The Conor sections are less self-consciously literary than those involving the Rigbys, but also less assured in tone, sometimes resembling a familiar brand of scruffy buddy comedy. Conor’s trying to save the failing New York restaurant he runs without having to ask for help from his successful restaurateur father (Ciarán Hinds). Bill Hader plays Conor’s best friend and head chef, and the two of them tussle on the floor and bust one another’s chops Apatow-style. Unlike Eleanor, Conor has moved on perhaps too fast from the event that tore their marriage apart, throwing himself into his work and the occasional one-night stand. His intermittent attempts to track down and confront his wife are inappropriate enough that he himself likens them to stalking, though she seems to regard him more as an importunate puppy than a threat. The process by which these two begin to circle around each other and feel out the possibility (or impossibility) of a shared future constitutes the movie’s meandering central story. A late scene where they finally come together to acknowledge all they’ve lost will rip you apart even if, like me, you’ve found the movie up till then more aesthetically pleasurable than it is emotionally involving. Chastain and McAvoy light up the screen in the rare moments they’re on it together—why, then, construct a cut around a Sleepless in Seattle–like structure that keeps them in different states for most of the film? It’s a course that whoever had the idea to combine these two movies into one—Harvey himself?—should have given a thought to sitting in on. I’m eager to see if Him and Her can fill in some of the spots left blank by this tale of thwarted passion, but a true identity, a reason for being, is exactly what The Disappearance of Eleanor Rigby: Them lacks.